Recent release “A Blessing and a Curse: From a Priesthood to a Slave” from Page Publishing author Obadiah Israel Yahweh is an enlightening book that looks into the things that affect people—from the biblical and ancient times to the present—who are given tasks and duties to fulfill. Obadiah Israel Yahweh, a well-versed author, has completed his new book “A Blessing and a Curse: From a Priesthood to a Slave”: a well-researched work that shows how the Hebrew Israelites are cursed and are still under the curse till the present. Published by New York City-based Page Publishing, Obadiah Israel Yahweh’s thought-provoking book is based on ancient history and the current times. Its premise is that the Hebrew Israelites made an agreement with the Lord to keep the covenant, and the curse is given to them because they have disobeyed him. 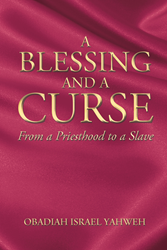 Readers who wish to experience this brilliant work can purchase “A Blessing and a Curse: From a Priesthood to a Slave” at bookstores everywhere, or online at the Apple iTunes store, Amazon, Google Play, Kobo or Barnes and Noble.